The season is not over for everybody but yet, the new season is already here; this is why we will be present this winter on the Dakar, Monte Carlo, Daytona Tests, Andros Trophy, to always advise you better on your equipment. This is also why we have started a cycle of meetings on our research program regarding the effects of heat on the racing driver: Heat Stress Program. The end of the year has been celebrated by the new arrival in our network of Stand 21 China, to whom we wish a very warm welcome and who allows us to extend our quality service across the world. This new Year is also the opportunity to introduce you to our new 2005 catalogue . We wish you a very good racing season. Stand 21 France (Dijon) is now open on Saturdays! We also attended the SAE Motorsports Engineering conferences which were held from November 30 th to December 2 nd in Dearborn (USA), under the presidency of Max Mosley (FIA president), Tony George (Indianapolis Motor Speedway president), Tom Compton (NHRA president), Mike Helton (Nascar) and Steve Johnson (SCCA). More than 150 people from the 5 continents were there to discuss about racing across the world. Come to visit our stand at Birmingham (Stand 9420) January 13 th to 16 th 2005 and come to our conferences on Heat stress and Hans® Device. After many tests done with independent laboratories & the French army, we are now able to explain to you why our ST2000 suit is much better at preventing heat stress than our competitors' and why we are improving our range (overalls, helmets, boots.) to offer you solutions which perform better in the thermal regulation of your body . To learn more about the Heat Stress and discover the results of the ST2000, click here. All our Hans® models have successfully passed the FIA homologation. We now offer an unsurpassed range of 8 sizes et 12 fitments with a unique design and the exceptional finish . Finally, we have started the development of a brand new helmet to fit extra large heads. We remind you that the FIA 86 homologation is no longer valid in all events under the FIA regulations. The only homologation accepted now under the FIA regulations is the FIA 8856-2000, from 1 Jan 2005. After the Formula 1, Nascar, DTM, Champ Car... and more recently (September 2004) the FIA GT championship, the Hans® has become compulsory in WRC (driver & co driver racing with a manufacturer) and in WTCC from 1 Jan 2005. It is now sure that this system, the most important safety innovation since the introduction of the helmet and the flame resistant suit, will become more and more compulsory in all kind of races. And to guide you best in the purchase of a Hans® Unit, it is most important to be advised by a qualified professional. Do not hesitate to contact our network of representatives. Our R&D department keep on developing the brand new gloves to comply with the new FIA homologation which will be the only one valid in all FIA regulated events starting 1 Jan 2006. 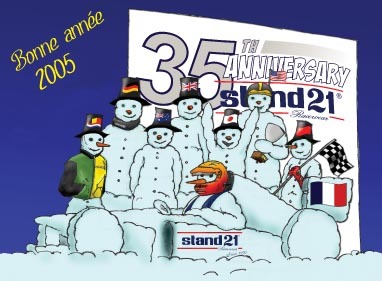 The favourite Stand 21 boots, the AXV are coming back! Rethought down to the slightest details, they offer even more comfort and ergonomy. A very dark visor will soon be available for Stand 21 helmets: the Sun breaker. You can now buy the Hans® air padding at an incredible value for its quality. It makes you forget you are wearing a Hans®. With the view to dress to whole team, we now offer you different models of pants and bermuda shorts (minimum 30 pieces, 7 colours available). You can also order with a minimum of 30 pieces the very strong and cheap MC1 mechanics suit (available in 7 colours). Finally, we have now introduced a vintage mechanics suit with a 50's / 60's design, for a perfect vintage look amongst your team. Take advantage of the best delivery times on the market for made-to-measure!!! At the moment we are look at 15 working days for a helmet. 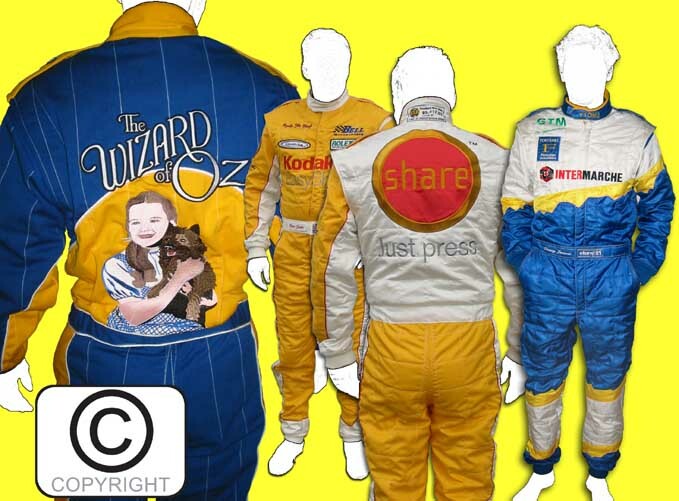 Please contact us for the racing suits delivery time. "You thought it was impossible?" Stand 21 China has just opened in Hong Kong! After 8 days of intensive training in Dijon, our new franchisee can advise you on our product. The 2005 catalogue is now available, you can order it by filling in this form.